In addition to generic posts on beauty, Dove keeps its Facebook fans engaged with back-to-back executions targeted at different products in its skin and hair care range. 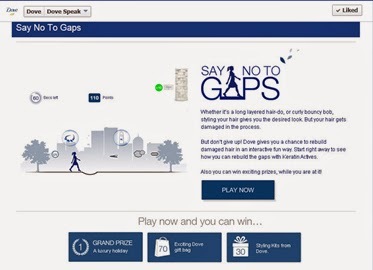 The latest is a cool game application ‘Say No to Gaps’ that promotes Dove’s new hair care range with Keratin Actives that apparently rebuild gaps in damaged hair by restoring cell proteins. In line with the value proposition, the simple game allows participants to collect Keratin Actives by hitting space bar and ducking Challengers like sun rays, straighteners, curlers, pollution etc. by hitting the arrow key. Fans can also share the application on Facebook and Twitter to earn more Keratin Actives, which is a smart move. The winners on the leader-board get to enjoy a luxury holiday, Dove gift bags and styling kits. The game concept has been done and dusted by P&G’s Pantene a couple of years back with its 'Break The Cycle’ application but that’s the case with most Facebook game ideas which repeat standard templates. Dove can surely do with some fresh thinking. Facebook is the great way to get instant promotions and get feedbacks from the customer base.